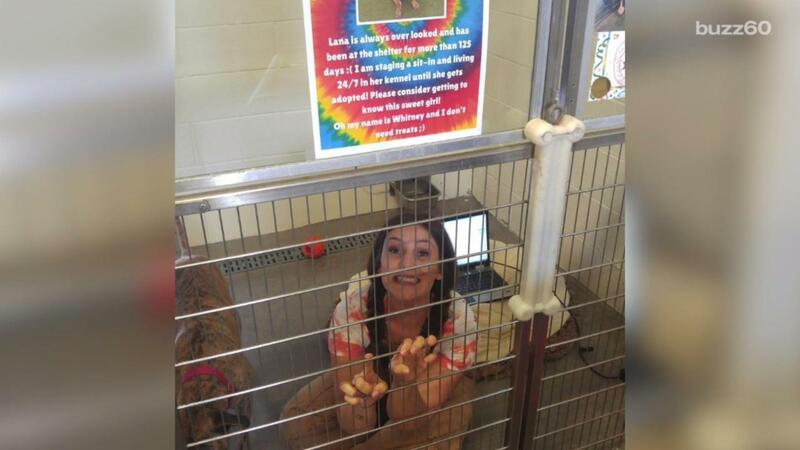 A shelter worker wants one of the dogs under her care to be adopted so badly, she's decided to live with her in the kennel until the pooch finds a new home. Lana is a 4-year-old bullmastiff mix, and she had a loving forever home for three years. Now she's living at the Arizona Animal Welfare League & SPCA, where she's having trouble adjusting back to shelter life. So Whitney Steele, the shelter's director of volunteers and events, has decided to help raise awareness by living with Lana until she finds a new forever home. Whitney is staying in the kennel 24/7 and holding meetings in there. If that wasn't enough, Whitney's even been sleeping on a dog bed to live just like Lana. Now that's commitment!